Sports play a significant role in the lives of boys and girls across the country. Many children are encouraged by parents and teachers to try a sport, make the team, and be the best. Although the intentions are good, many children and teenagers get burnt out quickly due to the pressure put on them by well-meaning adults. They quickly feel obligated to perform instead of finding the joy in the game. And while this is not the case for all children, it is becoming more and more of an issue across the country. America’s Finest Summer Camps takes a slightly different approach towards kids and sports. Many campers come to camp with a predisposition about what sports they are good at and which ones they aren’t. They assume that since they’ve played soccer since they were 4, they are exclusively soccer players. They don’t realize that although they’re familiar with soccer, it’s not the only thing they are allowed to try and enjoy. America’s Finest Summer Camps encourage athletes to try new things, to branch out from their comfort zones and get active in a sport that is new to them. Gymnasts at home become volleyball players at camp. Basketball players discover their love for golf. Camp gives campers a chance to try new sports that may not be offered in their schools or communities. And of course, for those who are passionate about their sport, camp gives them the entire summer to do what they love, perfect their craft, and surround themselves with other athletes who are passionate about the sport. Sports at camp are different than sports at home because the pressure is off. Sports are played to teach teamwork and sportsmanship. Sports are played to give campers a healthy way to relieve stress, to get in a good workout, and to practice goal setting. Sports at camp are designed to bring campers together through healthy competition. Participating in sports builds confidence and strengthens relationships, and provides a safe outlet for campers to try new things without judgment or pressure. Team sports like baseball, basketball, flag football lacrosse, soccer, and softball bring campers together towards a common goal. These sports encourage campers to work together on the field or court, which then translates to working together in other areas of camp life too. Playing a team sport allows campers to connect with other campers whom they may not have met otherwise. Individual sports like aerobics and figure skating still puts campers in group settings but allows them to focus on their personal skill set, goals, and abilities. No matter what type of sports campers play, they’re always surrounded by people who encourage them to be their best. There are no stressed-out parents to worry about, no crazy coaches screaming from the sidelines. Just friends, playing together for the fun of it. Campers can engage in sports as much or as little as they want to at camp. 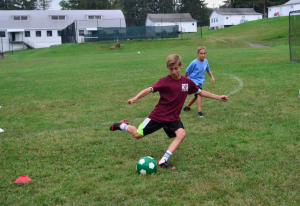 Seasoned athletes can work on new skills and improving their current skills, while new athletes can feel safe trying something new surrounded by the encouragement and support of their counselors and fellow campers. 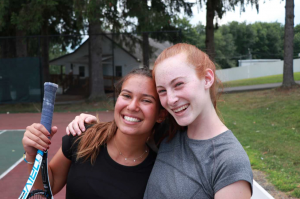 America’s Finest Summer Camps have built a reputation for offering an incredible sleepaway camp experience that combines art, music, sports, good food, great friends and the beautiful outdoors in a way that every camper will easily fall in love with.